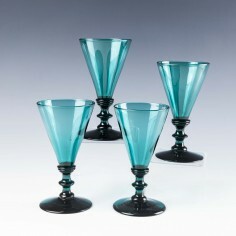 Victorian wine glasses are highly diverse in form and colour. Whole-coloured glasses can be found in many and varied hues: peacock blue, Bristol green, apple green, Bristol blue, yellow, amber, cranberry, ruby, amethyst, teal blue, turquoise, iridescent blue and the vivid uranium colours – and this list is by no means exhaustive. As a general rule, the bowls of Victorian wines glasses were larger than those of their Georgian and Regency predecessors; in the 18th century, the price of wines fluctuated wildly with the political situation, mostly wars with the French and the imposition of taxation to fund them. In the 19th century the price of wine fell in real terms and the increased size of wine glass bowls gave greater license by which the artistry of engravers and new decorative techniques could be displayed. A highly competitive and growing industry created a myriad of designs showing far broader scope than ever before. With colours and bowl decorations to the fore, stems were somewhat overlooked; whereas the 18th century mantra seems to have been “the more knops the merrier” Victorian wine glass stems became comparatively plain. 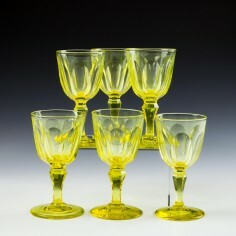 From the second quarter of the 19th century onwards, the extravagant designs of Bohemian glassmakers began to make an impact, with their penchant for intense colours and marbled glass, engraving and gilding setting the stage on which extravagant creations and a tranche of intensely-coloured hock glasses would find their niches. The somewhat inane perception of Victorians being universally staid and sombre is at odds with the nature of their glassware with its polychromatic excesses, and any collection of 19th century wine glasses is sure to make for an eye-catching display. 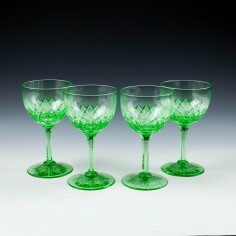 A stylish set of highly usable engraved uranium wine glasses which can be seen on our antique glass specialist store at scottitshantiques.com. 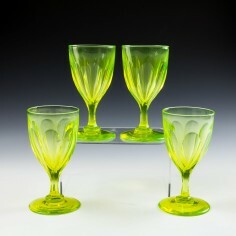 This delightful set of Victorian wine glasses boasting a spectacular uranium green colour and petal cut bowls can be seen on our scottishantiques.com online antique glass store. 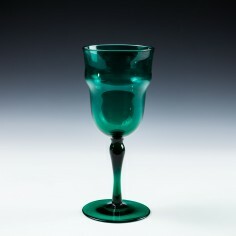 A James Powell & Sons, Whitefriars, wine glass designed by T G Jackson from 1870-90. Available from Scottish Antiques online store. 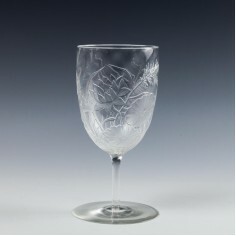 A talllLate 19thC continental facet cut stem and engraved wine glass. Available from Scottish Antiques online store. 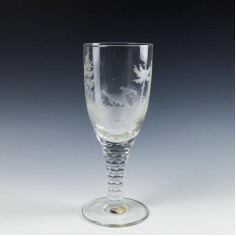 A fantastic quality Webb Glass Cameo Relief Cut Wine Glass from 1880-1900. Available at Scottish Antiques online store. 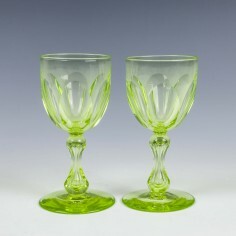 A striking pair of Victorian uranium wine glasses that are acid etched with decorative fruit and vines. 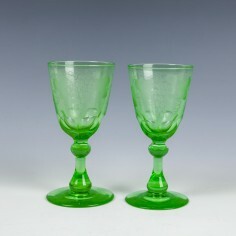 These can be viewed in detail our online antique store at Scottish Antiques along with our other uranium vaseline glasses. 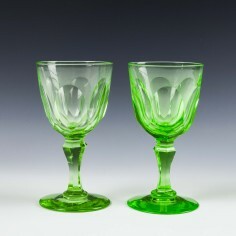 A stunning pair of Victorian uranium wine glasses often referred to as vaseline glass. 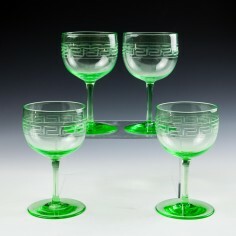 These can be found on our Scottish Antiques online store together with other examples of fine 19th Century stemware. 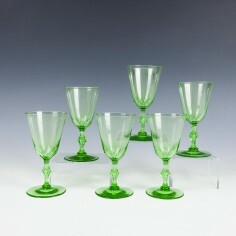 A stunning set of six Victorian uranium green wine glasses with petal cut bowls. This type of glass is coloured by adding a small amount of uranium to the melt usually around 2% by mass. 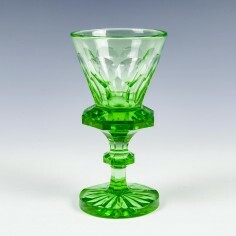 A very stylish Victorian uranium wine glass, this is remarkably heavy. 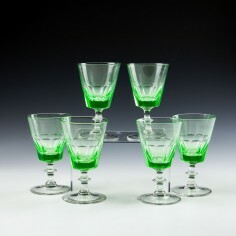 We have may more uranium vaseline glasses available within our antique store on line.